Artists often try to create an artificial deckle edge by hand tearing the edges of the paper, but this can be very hit and miss, often resulting in a ruined print. Using a steel ruler to guide one’s tearing or ripping is better, but often the edges produced have little “character” and are too uniform or straight with some papers. Digital artists have also tried to put in the look of a torn or deckled edge, by artificially painting the edges with various filters or Photoshop techniques. These digital effects are quite impressive and realistic. However, these digital methods pale in the “perceived value” customers give to an actual torn or deckle edge, because it appears to be “hand made” by the artist. But until the invention of the Dual Edge Ripper there was never a fast and easy way of producing a consistently good torn or deckled edge. 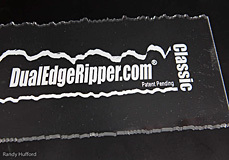 The Standard Dual Edge Ripper is made of clear Lucite, and is 24 inches long and 4 inches wide. See the instructional video here. See details Classic Dual Edge Ripper 24"
See details Extreme Dual Edge Ripper 24"